JURGEN KLOPP CLAIMS Daniel Sturridge can be a “decisive player” for Liverpool after impressive displays from the injury-plagued striker in pre-season matches. Sturridge, 28, went to West Brom on loan in January but was injured early on and managed just six appearances. With 12 months left on his contract it appeared Sturridge’s Anfield career was over but he has looked sharp in his five friendly games — scoring three goals — and Klopp, who became frustrated by the player’s unavailability last season, is prepared to hand him a lifeline. “We’re not in doubt — and nobody was ever in doubt — about his quality,” the Liverpool manager told the club’s website. In this moment he looks really good, to be honest. That’s cool — really cool for him and cool for us. [It's] a very important moment for him. I am in talks with him, what he feels. Sturridge could be in line to start the Premier League campaign at home to West Ham on 12 August, with Roberto Firmino and new goalkeeper and fellow Brazil international Alisson only rejoining the squad at next week’s training camp in France. Liverpool are currently taking part in the International Champions Cup in the United States. Email “Klopp offers Sturridge a lifeline at Liverpool after impressive pre-season performances ”. 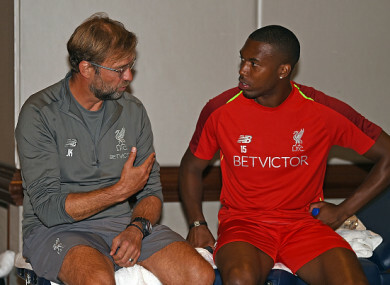 Feedback on “Klopp offers Sturridge a lifeline at Liverpool after impressive pre-season performances ”.